Spring means birds, flowers and the start of baseball! 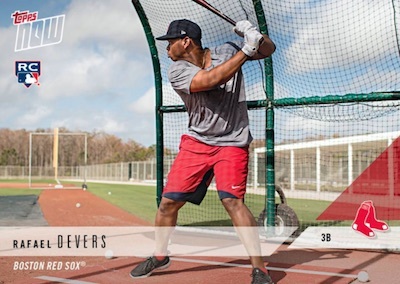 Getting collectors even closer to the early action, 2018 Topps Now Road to Opening Day Baseball kicks off the on-demand line for the new year with team sets featuring images from MLB Spring Training. Unveiling the 2018 Now MLB design, each team set includes 15 key players. Priced at $49.99, there is one 15-card or 16-card set for every team. While many of the Now cards have a limited sales period of only 24 hours, 2018 Topps Now Road to Opening Day Baseball extends that by a huge margin. The sets can be purchased starting on February 15 and ending on April 9. Shop for Now Road to Opening Day Team Sets on Topps. That might seem simple enough, but Road to Opening Day has a few other elements which may appeal to collectors. First, Bonus cards return from the 2017 release. If any of the following options are triggered, a bonus card is issued. Topps actually added new milestone awards for strikeouts and home runs, bringing the total to five different ways to earn a free card in 2018. Team is first in division at MLB All-Star break. Team no-hitter or perfect game during regular season/postseason. Player hits for the cycle during regular season/postseason. Player throws 15 strikeouts in a game during regular season/postseason. Player hits 3 home runs in a game during regular season/postseason. The 2018 Topps Now Road to Opening Day Baseball checklist also offers limited signed cards in the Autograph Edition sets. These 16-card or 17-card sets include one random numbered autograph from the team, and the full base set. Each signer has versions numbered to 99, 49, 25, 10, five and one-of-one. Aaron Judge is the exception as he only has the parallels numbered to 25 and less. While the standard base sets have the same pricing for every team, the autograph prices vary considerably. Starting at $69.99 per set, collectors can obtain the full autograph checklist for most teams by buying either three or four of the same sets, depending on the number of signers. The most expensive is the Los Angeles Angels set, priced at $399.99, as it features a chance at Mike Trout and Shohei Ohtani autographs. 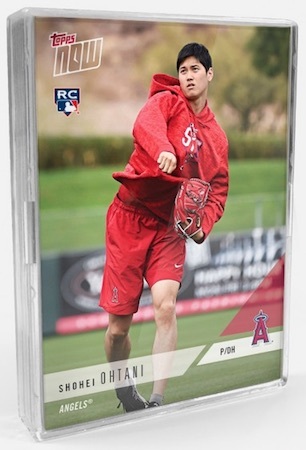 If you purchase four of the Angels sets, you are guaranteed the entire signed set including one autograph for Trout and Ohtani. As the Autograph Edition sets are limited, they can run out before the selling period officially ends. The team-by-team checklist is shown on the tab above. 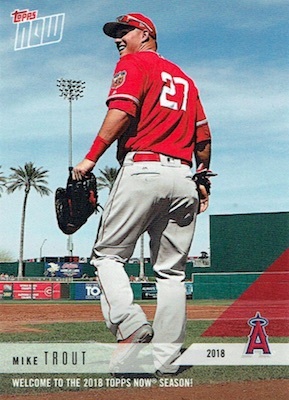 There is also a promo card that was mailed out by Topps for Mike Trout. It includes a coupon code for 25% off a 2018 Topps Now Road to Opening Day team set. The code is ST25. 452 cards in main set. Shop 2018 Now MLB cards on Topps. Additional bonus cards noted when known. AUTOGRAPH CARDS: #/99, #/49, #/25, #/10, 1/1. Signed parallels are randomly inserted in autograph sets. Not all teams have autographed sets. 15 base cards per set. Buy on eBay. Signed sets include one random autograph from the list plus full base set. 16 base cards per set. Buy on eBay.